This photo, released on February 4, 2013 by Shackleton Epic, shows crew members bringing the vessel Alexandra Shackleton to shore at South Georgia to successfully complete leg one of their historic re-enactment, during their expedition across the Southern Ocean to Antarctica. The team on Monday successfully recreated Ernest Shackleton's Antarctic survival journey. Expedition leader Tim Jarvis and Barry Gray reached the old whaling station at Stromness early Monday after a 900-metre (2,950-foot) climb over the mountainous interior of South Georgia. "It was epic, really epic, and we've arrived here against the odds," said Jarvis, who with Gray completed the climb using the same kind of clothing and gear that Shackleton and his men would have worn in 1916. "The ice climb at the Tridents is a serious thing and Shackleton didn't exaggerate—with ice at 50 degrees, with one wrong foot, we could have careened down a crevasse." Jarvis, 46, said he and Gray, 38, had more than 20 crevasse falls up to their knees during the climb with the latter plunging into one up to his armpits, requiring their one-man support crew to help pull him free. Graphic showing the re-enacted route of Ernest Shachleton's 1916 Antarctic survial ordeal. A team of exhausted explorers successfully completed the journey on Monday after 12 days in a lifeboat followed by a three-day mountain crossing. "These early explorers were iron men in wooden boats and while modern man mostly travel around in iron vessels, I hope we've been able to emulate some of what they achieved," he said. "There's no doubt in my mind that everyone has a Shackleton double in them and I hope we've inspired a few people to find theirs." 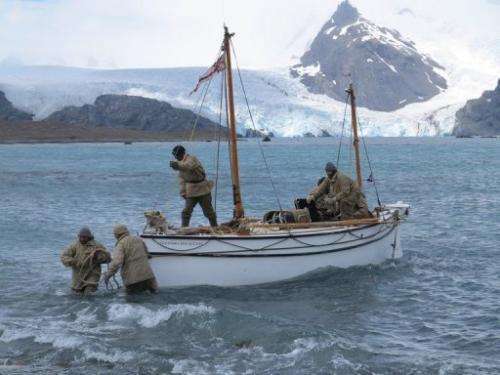 The crossing follows a 12-day re-enactment of Shackleton's 800 nautical mile journey in a spartan lifeboat from Elephant Island to South Georgia, along with four other members of the British-Australian team. 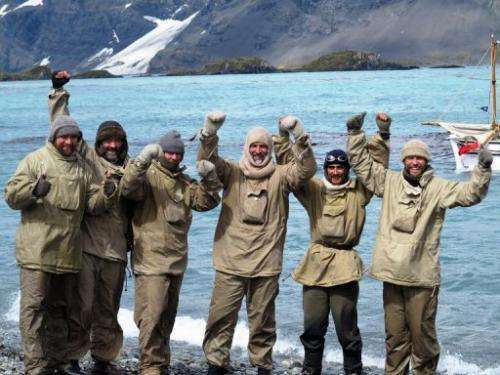 The Shackleton team at South Georgia, February 4, 2013, cheering their successful completion of leg one of their historic re-enactment, during their expedition across the Southern Ocean to Antarctica. Jarvis and Gray had planned to make the mountain crossing within 24 hours but were held up by an extreme storm. They were forced to hunker down on the mountain, resorting to using a modern tent and sleeping bags to stay alive as snow and sleet and 50 knot winds pounded them on Saturday. 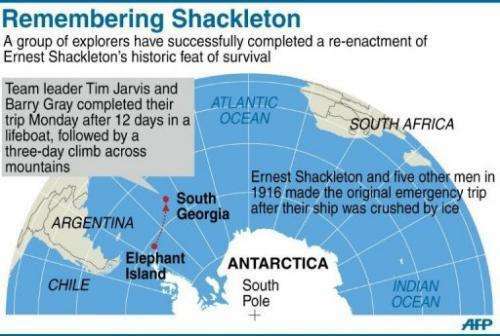 "We've had to adapt just as Shackleton and his men did and we had to survive," said Jarvis, adding there were times they thought they might not make it. Shackleton's 1916 journey to raise the alarm about the sinking of his ship the Endurance is considered one of the greatest-ever survival tales. 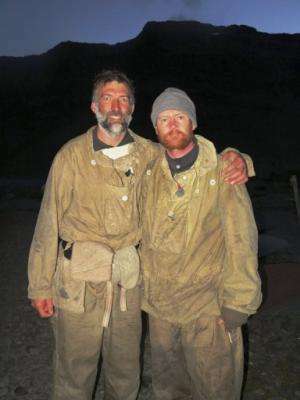 This photo, released on February 10, 2013 from Shackleton Epic, shows expedition leader Tim Jarvis (L) and mountaineer Barry Gray on arrival at Stromness after a gruelling three-day climb across the mountains and crevasses of South Georgia Island. During his third visit to the region the explorer's boat became trapped in 1915 and sank 10 months later as it was crushed by the advancing ice. After living on the floating ice until April 1916, they set off in three small boats for Elephant Island. From there, Shackleton and five crew made the voyage to South Georgia, reaching their destination 16 days later to face the mountainous trek to the whaling station at Stromness to raise the alarm. All members of the Endurance were eventually rescued. Shackleton is considered among the great Antarctic explorers, along with Norway's Roald Amundsen, the first man to reach the South Pole in 1911, Australian explorer Douglas Mawson and Briton Robert Falcon Scott.